When we pass through the gates of Hollywood Studios, we are usually left with a decision as to whether to ride Tower of Terror or Rock ‘N Roller Coaster first. However, there are parts of the park that deserve some extra time and attention because there are some great additions to the park there. 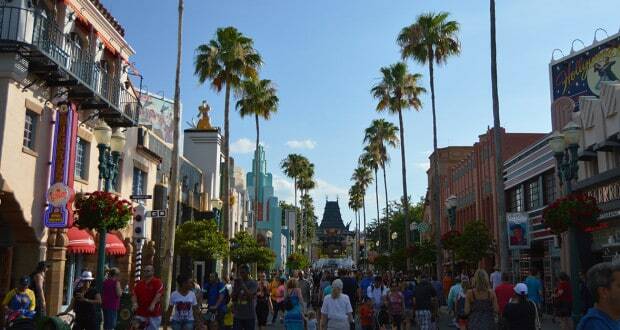 One of these areas that deserves some extra time is Hollywood Boulevard as you enter the park. Here is our list of the five things that you don’t want to miss the next time you’re at Hollywood Studios. 5. Entertainment – the entrance to Hollywood Studios and Hollywood Boulevard is home to a majority of the entertainment options housed at the park. Roving throughout the day are the Citizens of Hollywood in pop-up scenes up and down Hollywood Boulevard. These scenes are hilarious and add to the overall enjoyment at the park. Guests can also find the myriad Star Wars shows on Hollywood Boulevard – there is the March of the First Order, Stars Wars: A Galaxy Far, Far Away, and Star Wars: A Galactic Spectacular. Guests can also enjoy the nightly showing of Disney Movie Magic. With so many entertainment options happening, you’ll definitely want to check out the Times Guide or consult your My Disney Experience app to make sure you aren’t missing a thing! 4. Snacks – the variety and deliciousness of the snacks along Hollywood Boulevard is huge! Disney purists can find the classic favorites of popcorn, as well as Mickey pretzels at various snack stands dotting Hollywood Boulevard. If you are looking for something different, guests should stop in the Trolley Car Café which houses the Starbucks location at Hollywood Studios and there are a variety of sweet snacks to satisfy your appetite. On particularly hot days, you will also be able to find ice cream carts around with all of your favorites. You’ll also want to check out the Hollywood Brown Derby Lounge – this location is outside and offers guests small plates and tasty drinks while being able to absorb the surroundings and shows! 3. Characters – Hollywood Studios is the place to be for guests looking to meet and interact with characters. While many characters at Hollywood Studios have their own dedicated greeting locations, guests can meet characters along Hollywood Boulevard. We’ve been able to have our photos taken with Donald, Daisy, Pluto, Goofy, and Chip ‘n Dale. The locations and times of these interactions are subject to change, so be sure to keep your eyes peeled for these characters or consult your Times Guide so you won’t miss out! 2. Shopping – some of our favorite shopping locations in the whole of Walt Disney World are found along Hollywood Boulevard. Guests looking for unique and classy souvenirs can find a wonderful selection at Keystone Clothiers. Disney and Co. offers guests the classic souvenirs, toys, and t-shirts. Across the street you will find the specialty souvenir shops at Adrian and Edith’s Head to Toe, Celebrity 5 & 10, Cover Story, and the Darkroom. You’ll definitely want to make sure you stop by all of these stores when you enter the park and again before you leave! 1. Atmosphere – we love walking down Hollywood Boulevard and taking in all of the atmosphere offered. We love the neon signs, the working pedestrian signs, the billboards, the palm trees, and the store fronts. It makes the guest feels transported into the set of a movie in the 1940s and 1950s. It may be tempting to walk to your first FastPass or favorite restaurant, but take the time to take in the details that make up Hollywood Boulevard! Walking down Hollywood Boulevard is usually a keep experience as you are headed towards Toy Story Midway Mania, Star Tours, or down Sunset Boulevard to ride Tower of Terror or Rock ‘n Roller Coaster, but if you walk by too quickly, you will miss out on all that Hollywood Boulevard has to offer! Slow down and take it in – you’ll be glad that you did!